The natural progression for construction companies looking to do business with the government is to grow their subcontracting work into prime contracts. The step up to prime time can be done; however, in this competitive and compliance-focused industry, procurement is gained through tenacity, thoroughness and patience (the “stick-to-it-ness”). I have witnessed the downfall of far too many companies that were impatient and expected “one government meeting” to result in a contract. Or their expectations are not aligned with reality, as in, “I have my 8(a) certification, where is my work?” Success can be yours if you’re willing to plan the work and work the plan — let’s roll up our sleeves and get started! 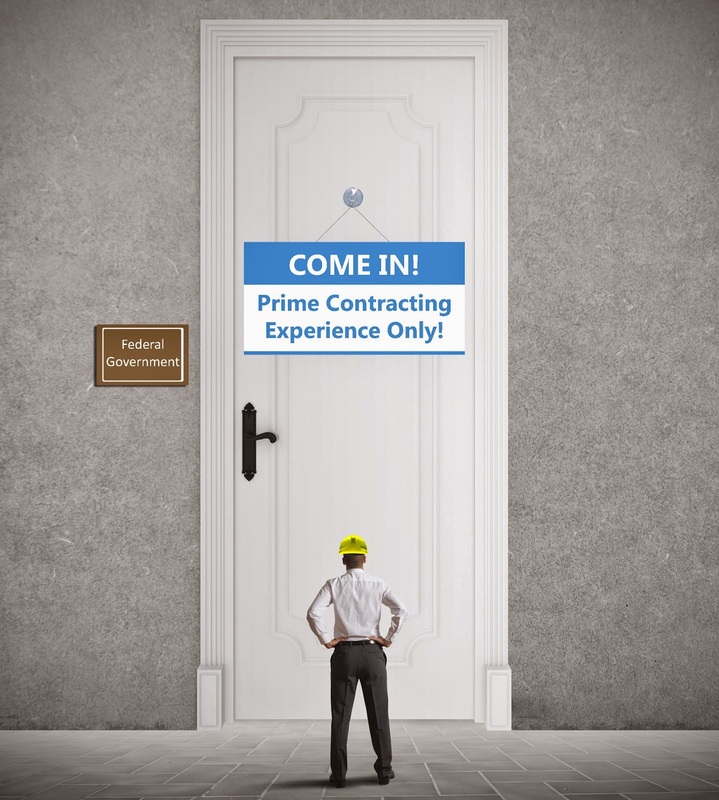 So you’re knocking on the door of a federal government agency, hoping to score a prime contract —only to be turned away because you lack the exact prerequisite you are looking to attain — federal prime contract experience. How do you get past this Catch 22? In a nutshell, stay persistent, be patient and be prepared for an initial investment. 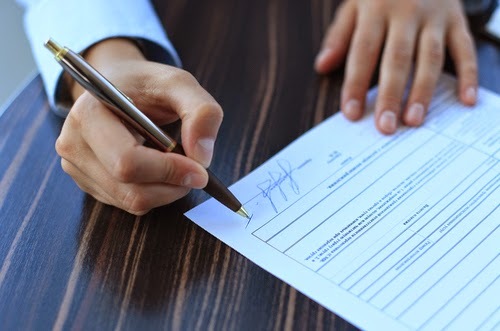 An American Express survey of 1,500 entrepreneurs who were government contractors or actively pursuing a contract found that most were turned down the first two years before finally procuring their first project award. That takes a lot of staying power, as in, “I will bet turned down, but keep trying.” It also takes a bit of financial investment. The same survey found that, in 2010, small business contractors reported investing $103,827 over the course of a year in the bidding process for federal contracts, up from $86,124 reported the previous year. This investment surely includes persistent bidding, presentations and business development efforts to obtain that first contract. So what is that $100,000-plus a year being spent on? More than likely, your first prime contract is going to come from a sole-source award or a low-price bid because you’re not-yet able to compete based on experience. (Remember, you don’t have experience yet!) Your job at this point is to hone-in on how to best utilize those dollars. One way to position yourself for a sole-source award is having expertise in a single key scope of work. (Emphasis on “key scope” — installing door hardware, for example, will not get you to the required minimum of 15% self-performance on typical projects unless the entire project is in fact installing door hardware). As with any industry, you need to bring something to the table, and make sure what you offer is a solution to your customer’s needs. For instance, you wouldn’t market Photovoltaic (PV) installation in Seattle, with its 200-plus overcast days, verses in sunny Yuma, Arizona. It is also vital to be in front of all your government clients with your marketing materials and capability statements, and these need to be backed up by superb or outstanding performance ratings. Essentially, this is your background check. (You wouldn’t hire an employee without verifying their credentials, and neither will the government.) To that end, do an honest assessment of what your company realistically can and can’t do; above all, know your strengths and capabilities. You may sound good on paper, but your actual past performance speaks for itself. The government sees right through unsubstantiated and vague statements — a “We do everything” blanket statement will not get you far in a one-on-one capabilities briefing. A better strategy to follow in your capabilities briefing is to highlight what you are realistically capable of doing, how you will pull together all of the other necessary resources, and align that with what your customer is looking for. The government is not looking to contract with construction managers; they want people who can perform major aspects of work. You should already have personnel in place or lined up for the work you are chasing. Communicate your staffing plan to your potential customer. Get a clear grasp of how you can meet your client’s needs, and have the solutions ready before going to in-person meetings. Remember, each customer and each federal installation is different, so do your homework before any one-on-one meeting! Also keep in mind that there’s no shame in playing a supporting role. Most actors have supporting roles before landing the big part; the same goes with contracting. If you’re only getting subcontracting work, keep increasing the size of the project you subcontract on so the government can see your growing responsibilities and capabilities. Get savvy on government rules, regulations and lingo. Understand the funding process, prime contracting responsibilities, how the NAICS codes and size standards work, as well as teaming regulations and allowances, and keep your certifications current. Whenever possible, go straight to the source. Understand who within your customer’s agency is responsible for allocating funds and selecting contractors. An old colleague of mine had it right – he never stopped knocking on the door until he was in front of the “decision makers.” Be that resilient. Winning your first government prime contract can be a milestone for your company; but you still have a lot of work to do. In many ways, you are still in the audition process; the government is testing you to see how well you manage government projects. Do whatever you can to avoid an adverse past performance rating. The less experience you have, the more crucial it is to have overall favorable past ratings. One poor rating out five projects, for example, represents 25% of your work, whereas one negative past performance rating out of 50 projects reflects only 2% of your work. Stay active in cultivating your relationships while onsite and continue to knock on doors as you do when you have no prime contract experience. Define what your mix of project types will look like in terms of size, scope and building types and begin to strategize your portfolio on projects that will take you to the next level. This is also the time to really invest in your marketing and estimating. The toughest proposals to write are the ones where the Company almost qualifies or barely qualifies. This makes it difficult to differentiate from the competition and almost always risks elimination from competition before your price can even make it through the review process. § Bidding process. Formalize your bid/no-bid process to ensure you are only pursuing financially viable projects as well as those that add to your strategic project portfolio. § Teaming and joint ventures. Be selective in your teaming. My personal preference is to pursue projects as an informal “team” or traditional prime/sub relationship versus as a joint venture. This method allows for more control and less risk. There are instances where joint ventures may be necessary to qualify, but I highly recommend this option only when it’s absolutely necessary. Regardless of the approach used, utilize teaming and joint ventures to elevate your experience, in project size and/or location. § Relationships with your current customers. Each new customer and location requires an initial investment. Continue to cultivate your current relationships. It is easier and cheaper to work in the same location (less mobilization costs, personnel remain happy by not having to move around or relocate, the customer’s unique processes are likely already understood, so there is less of a learning curve in how to please the client). § Past Performance. Again, I cannot emphasize this enough - get favorable past performance ratings. These do matter and are often the highest-rated evaluation factor in a proposal. § Define your strategic project portfolio. Just like when you are starting your company, growing your business can be somewhat of a Catch 22. You need the exact experience of the work you are trying to chase. Defining the project wins that will take you to the next level and grow your business should start years in advance. Do not be afraid to continue to adjust this plan as the market and/or your company direction change. Go after your strategic portfolio projects with diligence, and make sure you approach with a formal capture planning process. One more key piece of advice as you take this federal contracting journey is to not grow beyond your capabilities for the sake of growing. Stay within your means, and be patient. Success in any industry is not overnight – and federal contracting is no different. Follow a realistic plan and don’t haphazardly bid. Financial planning aligned with market analysis is so critical to your success – so spend time on these planning processes as you develop and grow your business. 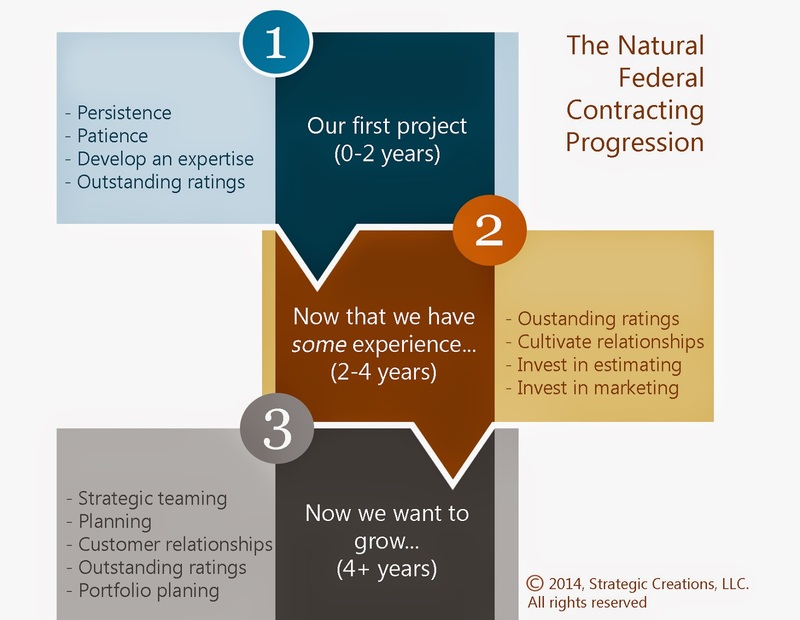 Click on the graphic below the byline for a visual entitled "The Natural Federal Contracting Progression". If you would like more information on developing or growing your federal contracting business, don’t hesitate to contact me at sarah@strategiccreations.com.